According to CongoPlus and sources in Brazzaville, Spanish company Aurantia is investing in a cluster of palm plantations in the Republic of Congo with the aim to produce biodiesel from the oil. After a visit with president Denis Sassou-Nguesso, CEO Rafaël Naranjo Anegon announced that Aurantia will be building four oil palm mills to process fresh fruits from a plantation that will cover several thousand hectares. Anegon said his group has acquired recent experience with the nascent biodiesel industry in Africa and with its potential, most notably in Mozambique, Senegal and Guinea. Feasibility studies are already underway, with the aim to analyse the different plantation and mill sites, and to assess the state of the existing logistical infrastructure in the country. The actual size of the investment was not disclosed. Congo-Brazzaville is currently a minor producer of palm oil. The country is host to parts of the world's second largest rainforest, that of the Congo Basin (see picture, click to enlarge), which spans the Democratic Republic of Congo (Congo-Kinshasa), the Central African Republic, Congo-Brazzaville, Gabon, Cameroon and Equatorial Guinea. In Congo-Brazzaville, the dense tropical rainforest mainly stretches over the Northern part of the country, whereas in the center and the South, it is covered by mosaic, secondary forest and large savanna type vegetation. Even though the country has strict rules in place to regulate forestry and to make it more sustainable, illegal logging remains a major problem. A major Canadian company with a vast eucalyptus plantation in Congo recently invested in a 500,000 ton wood chipping plant, one of the world's largest, with the ultimate aim of supplying the rapidly growing global biomass market (earlier post). Even though the Spanish company's project is expected to yield a significant number of employment opportunities for Congo's largely impoverished population, it did not offer any insights into how it sees itself within the context of sustainability and of the fragility of Congo's environment, neithor into how it would guarantee its palm oil is produced in an environmentally friendly manner. The company is not (yet) listed as a member of the Roundtable on Sustainable Palm Oil, a multi-stakeholder organisation uniting NGOs, governments and the private sector with the aim of making palm oil production more sustainable. Thermoset resins are some of the most commonly used materials in the construction, furniture and automotive industries. World demand currently stands at around 25 million tonnes per year for the product that is used to make a wide variety of composite materials from particleboard to glass fibre panels and fighter jet wings. At present all the raw materials used in these resins are derived from petrochemicals, and the toxicity and volatility of starting materials such as formaldehyde require careful environmental, health and safety monitoring. But there will soon be a new, greener alternative on the market based on a new generation of ‘bio-resins’ – thermoset resins derived principally from vegetable oils. Research supported by the UK's Sustainable Technologies Initiative [*.pdf] shows how the renewable polymers could offer a commercially viable alternative that would help manufacturers to meet tighter environmental regulations and reduce consumption of finite petrochemical resources. They would meet growing demand for more environmentally friendly resins that are competitive in price and performance and adaptable to existing composite manufacturing processes. In the REPLANT project, a research team from the BioComposites Centre at the University of Wales, Bangor, who specialise in renewable plant technology, worked with industrial partners Cambridge Biopolymers, a contract manufacturer and a resin end-user. The project was supported by the DTI through the Sustainable Technologies Initiative, a programme to improve the sustainability of UK business. STI research aims to achieve economic growth and employment while safeguarding the environment and conserving natural resources. "There is a clear place in the market right now for new, more environmentally friendly resins that are competitive in price and performance, and adaptable to existing processes for manufacturing composites," says project manager Dr Paul Fowler. "The growing interest reflects the demand for alternative, renewable sources of thermosetting resins that will begin to address the depletion of finite resources and reduce emissions." "Our clean and green chemical processing technologies make it possible to produce bio-resins from renewable resources," says Dr Fowler. "We’ve succeeded in developing a low effluent manufacturing procedure that’s based on the use of vegetable oil, water, air and electricity and yields formaldehyde-free products with excellent performance characteristics." A key step was the development of a technique known as ozonisation to turn the vegetable oil into thermosetting resin. Patent applications have been made for the novel process technology, which is based on the use of ozone gas, and operates at ambient temperature. The clean, low effluent manufacturing process yields formaldehyde-free products with a high solids content of over 75%. Development of the new process is expected to appeal to thermoset manufacturers by making it easier for them to meet health and safety regulations in the workplace as well as demand from customers for greener products that are formaldehyde free. In demonstration trials on factory production lines, the bio-resins performed well. Performance matched that of petrochemical resins. The trials demonstrated that the process is capable of working on an industrial scale and commercialisation is expected to follow. The first applications are likely to be in selected insulation products, with future potential in industries ranging from electronics to automotive, construction materials, furniture, foundry and engineered wood products. "Our long-term aim is partial replacement with a bio-based alternative of the many hundreds of thousands of tonnes of petrochemical-derived thermoset resins that are currently used in the UK and rest of Europe every year," says Dr Fowler. "As well as helping us to develop the bio-resin technology, the STI project has demonstrated the sound economic, environmental and social gains that would accrue." For rapeseed growers, the project could open up a valuable potential market outside the food and biodiesel industries. The outcome should provide a significant advance in the industrial usage of agricultural crops, with a market for tens of thousands of tonnes of oilseeds per year. Substituting bio-resins could also help to meet UK government targets on environmental CO2 by reducing greenhouse gases. Growing rapeseed has the effect of sequestering carbon dioxide from the air. For every tonne of bio-resin produced approximately 2.5 tonnes of carbon dioxide would be fixed. Energy savings could be an added benefit as rapeseed meal, left over when oil is extracted, can be used to generate electricity. By producing oil on the same site as bio-resins the recovered energy could be used to power the ozonisation process. The European Commission's ambitious proposal to increase the EU's share of renewable energies to a mandatory 20% of the bloc's overall consumption by 2020 (earlier post), which was endorsed by the Union's Environment ministers (earlier post) is being resisted by leading nuclear energy power France, despite last-minute efforts by Germany and a recent spectacular U-turn by Britain. "We believe we have to be ambitious and therefore we have to support the proposal for a binding EU-wide 20% target for renewables," the spokesman said, adding that the EU needed to be ambitious if is to convince other countries, including the US and China, to take action on climate change. At a meeting on 15 February, energy ministers backed the 20% share target but insisted that it be kept as a flexible objective "taking into account national circumstances". Germany, currently holding the rotating Presidency of the European Union, will chair the March summit, also hopes to make progress on renewables as part of efforts on climate change that will culminate with a G8 summit it will host in the Baltic Sea resort Heiligendamm on 6-8 June. Denmark, Sweden, Spain, Slovenia and Italy are all said to be firmly in the camp of those supporting a binding EU target. "We are not in favour of fixing binding targets in renewable energy," said a French official after a meeting of EU ambassadors in preparation for the summit on 28 February. "It is up to each member state, in all flexibility and subsidiarity, to set its own objective. Our position has not changed." France prefers that the summit limits itself to supporting a binding target on greenhouse gases, an objective that leaves it sufficient flexibility to bank on its strong nuclear industry, which is low in carbon intensity. France derives 880% of its own energy needs from its nuclear power plants - the largest national share in the world - and also exports much of this energy to neighboring countries. However, French President Jacques Chirac may also decide to exit with a flourish, in what will be his last European summit before he steps down in May. France and Poland's resistance versus the UK's decision to join Germany, the European Commission and other member states, has now raised the stakes of the crucial Spring Summit that will take place in Brussels on 8-9 March 2007. 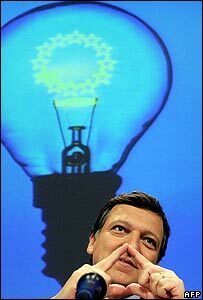 Picture: President of the European Commission José Emannuel Barroso during the presentation of the Commission's new energy policy proposal. Sergio Marini, the newly appointed president of the Italian farming industry association Coldiretti, Europe's largest, has met with EU agricultural commissioner Mariann Fischer Boel in Brussels, appealing to her for replacement of all non-biodegradable plastic bags in the EU by biodegradable ones by the year 2010. Marini argued that 1.4 million tones of carbon dioxide emissions and 700,000 tonnes of petroleum can be saved in Europe each year through substitution of conventional plastic bags with bags made out of biodegradable plastics (earlier post). According to Marini, the switch would require use of three million hectares of agricultural land, or 1.5 percent of the present cultivated area in the 27 countries of the EU, to produce the amount of maize and sunflower needed to support such a switch for all the 100 billion bags that are today mainly imported from China, Thailand and Malaysia. Marini continued by saying that 0.5kg of maize and one kg of sunflower oil are sufficient to produce around 100 bioplastic shopping bags with an environmental effect justifying the present higher cost at eight cents for a biodegradable bag against five cents for one made in traditional plastic, with the biodegradable bag cost on a downward trend. Coldiretti is involved in a bio-refinery project with bioplastics producer Novamont that has proposed using land set aside by the EU rules to grow the materials needed for bioplastics production. As part of a series of bilateral agreements on 'mutual development' towards the 'Bolivarian Alternative', Cuba and Venezuela have agreed [*Spanish] to co-operate on the construction of 11 ethanol plants that will use sugarcane as a feedstock and that, besides liquid transport fuel, will deliver renewable electricity to the grid, obtained from burning bagasse. During the closing ceremony of the VIIth 'Reunión Mixta Cuba-Venezuela', Cuba's interim-president Raúl Castro, Venezolan Minister for Energy Rafael Ramírez and the Cuban Minister for Sugar, Ulises Rosales signed contracts that will provide funding for the Cuban ministry and that will initiate the construction of four ethanol plants. Cuba's Minister for Foreign Investments, Marta Lomas, said that ethanol would replace leaded gasoline. 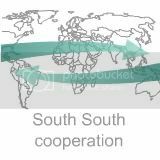 She added that bilateral co-operation between the two countries has been increasing steadily since the year 2000: in that year, 31 projects worth US$28.5 million were agreed on, whereas in 2007 some 355 projects were established, valued at US$1.5 billion. Direct Venezuelan aid to Cuba will amount to US$1 billion this year. Cuba used to have a large sugar sector, which has gone into steady decline after the collapse of the Soviet Union, even though sugar exports remain one of the island state's largest earnings of foreign currency. The past two years has seen a resurgence of the sector, mainly driven by the ethanol opportunity, and experts predict Cuba to reap massive benefits from it because of the competitive advantage of sugarcane (earlier post). Venezuela on the other hand has a very large unused agricultural potential and land base, which Hugo Chavez has offered earlier to foreign investors interested in establishing energy plantations (earlier post). The 'Bolivarian' state has already begun construction on 17 domestic ethanol plants (earlier post). Wang Hongguang, Director-General of the China National Center for Biotechnology Development (CNCBD), recently published an informative piece on China's bioenergy plans. In the text, Hongguang feels he has to eliminate some commonly held myths about biofuels, and instead focuses on the advantages of the bio-economy. Some of the misunderstandings are deliberately perpetuated by those who oppose the transition to a climate-neutral, clean post-oil future. Misunderstanding one: "biomass energy will use up a great deal of grains. In developing biomass energy, grains can be used as raw materials but sweet sorghum, sweet potato, cassava, straws, sugar canes can also be used as raw materials; both various kinds of waste oil and rapeseeds can be used to produce biochemical diesel oil. China abounds in non-grain biomass resources with starch, grease, cellulose, hemicellulose and xylogen as the bases. For the moment, China's annual grain outputs amount to 500 million tons, while over 700 million tons of straw will be produced. In China, there is an area of about 100 million hectares that is not suitable for planting grain crops but can be used to plant special plants as energy resources; and the area of pieces of land on which man-made forests can grow add up to 46.67 million mu. If 20 percent of such an area were made use of, about 10 billion tons of biomass could be produced each year; with such biomass energy resources as cassava and sweet sorghum added, at lest about 100 million tons of alcohol and biochemical diesel oil could be produced each year and such an output is equivalent to twice the output of the Daqing Oilfield [China's largest]." Misunderstanding two: "biomass energy will strive for land against the production of grains. The raw materials for biomass energy can be produced by making use of eroded and poor lands, sloping fields and ameliorated saline lands, and it is completely possible that it does not compete for land against the production of grains." Misunderstanding three: "The cost for biomass energy is high. It is expected that biomass energy will become one of the energy resources with the lowest costs. The three major reasons are as follows: firstly, the raw materials for biomass energy are less expensive, easy to develop, and easy to transport; secondly, as biomass energy can be produced on the spot, production costs can be saved by a large scale; thirdly, as breakthroughs have been made in biomass energy technologies like biochemical diesel oil, production of hydrogen from biomass, and oil extraction from biomass, costs for energy production will be cut down by a large margin." Misunderstanding four: "biomass energy technologies are not mature yet. Biomass energy, which mainly makes use of the Bio-fermentation technology, is a kind of comparatively mature technology. As a whole, China's biomass energy resource technology has evolved into a stage where studies and industrialization develop together with each other. The technological level of China's fuel ethanol has become leading internationally. If calculated according to the present price of petroleum, it is completely possible to realize the objective that a large-scale production can be realized without any subsidiary from the State." Firstly, "to improve the ecologic environment. Biomass energy will not produce much carbon dioxide when being used, and green plants will absorb a great deal of carbon dioxide when conducting photosynthesis instead. Therefore, the discharge of carbon dioxide will be cut down in a large scale by developing biomass energy." Secondly, "to increase farmers' incomes. To develop biomass energy can create employment opportunities and bring more incomes to farmers. It is briefly estimated that to create a "green Daqing Oilfield" is equivalent to give RMB 120~150 billion yuan [€11.8-14.7/US15.5-19.4 billion] originally used to import petroleum to farmers and biomass energy enterprises while 12~15 million jobs could be thus created." In a country where social inequalities and the rift between the farming class and the wealthy urban elites is growing rapidly, investments in bioenergy offer a step towards closing this gap (earlier post). This is one of the main reasons mentioned by senior Chinese officials: bioenergy holds the potential to redistribute wealth, to revitalise the rural economy and to elminate some of the social and economic push-factors that drive farmers towards the cities and into the migrant working class, which lives in dire circumstances. China's internal migration is the largest migration ever seen anywhere in peace time, and frankly, the phenomenon is a social tragedy of vast proportions. This is why it is crucial for China to develop strategies to revitalise the agricultural sector, which still employs the majority of the Chinese labor force. Bioenergy has been identified as one of the options, as it brings badly needed incomes, value to farmers' lives and of course mass employment. Recently, China has made substantial progress in its development of biomass energy. The State Forestry Administration and PetroChina Company Limited (PetroChina) signed an agreement, which prescribes that since this year, both parties will jointly set up a series of forestry biomass energy resource bases in Yunnan and Sichuan; and at the initial stage, the scale of any base will not be smaller than that of a demonstrative base for Jatropha curcas L. forest that can provide raw materials to exploit 200,000 to 300,000 tons of biochemical diesel oil and the area of all those bases will add up to over 600,000 mu. By the end of the Eleventh Five-Year Plan Period, PetroChina will build up a production capacity to produce over two million tons of alcohol made from raw materials other than grains, shape up a scale for commercial purposes that can produce 200,000 tons of forestry biochemical diesel oil, and provide supports to build up raw material bases of biomass energy resources with an area of over 400,000 hectares. As shown by survey statistics, it is found out that there are 154 tree species with their respective seeds having oil content above 40 percent in China and over a dozen of such tree species can be cultivated and exploited in a large scale. By 2020, over six million tons of oil would be produced if 200 million mu of energy resource forests were cultivated. Although the price of petroleum in international markets has somehow decreased for the time being, the fact that mineral energy resources are gradually becoming deficient will remain unchanged. Biomass energy including fuel alcohol, biochemical diesel oil, marsh gas, biomass power generation, and production of hydrogen from biomass is publicly recognized as one of the most important alternate energy sources that are featured with cleanness, being highly effective, safety, and sustainability. Major technologies for biomass energy have already shown a trend of getting mature and large-scale production of biomass energy is being developed in many countries, thus biomass energy is playing an important role in increasing the amount of energy resources, adjusting the energy structure and ensuring energy security. Biofuels for aviation have received a lot of attention lately, not in the least because the single biggest cost-factor for an airline consists of fuel costs. The airline industry is also a major contributor to greenhouse gas emissions. The search for alternatives for petroluem-based kerosene and jet-fuel has so far resulted in a breakthrough in Brazil, where a biofuel company is cooperating with Boeing and NASA (earlier post) and as well as in Argentina, where the airforce has been testing biofuels mixed with jet-fuel ('bio-kerosene') (earlier post), whereas the U.S. Air Force has been experimenting with synthetic fuels, which can be made from biomass (earlier post). The University of North Dakota recently received a US$5 million grant to develop military bio-jet fuels (earlier post). And an airline moghul, like Sir Richard Branson, has repeatedly hinted at a future in which aviation biofuels will become viable on a large scale (earlier post). Serious research challenges remain, though, because aviation biofuels need to have special properties, such as a high energy density and properties that allow them to be used at high altitudes and under very cold conditions, and in jet engines. Ordinary biodiesel won't do. North Carolina State University engineers have now announced they have developed a biofuel technology that has the potential to turn virtually any fat source into fuel to power jet airplanes. The technology – called 'Centia', derived from the Latin 'crudus potentia' or 'green power' in Latin – is '100 percent green', as no petroleum-derived products are added to the process. Centia can also be used to make additives for cold-weather biodiesel fuels and holds the potential to fuel automobiles that currently run on gasoline. high temperatures and high water pressure strips off the free fatty acids from the accumulated feedstock of oils and fats, or triglycerides. the free fatty acids are decarboxylated in a reactor to perform; that is, carbon dioxide is taken off the free fatty acids. The result consists of alkanes, or straight-chain hydrocarbons of either 15 or 17 carbon atoms, depending on the feedstock. the straight chains are boken down into molecules with branches, making them more compact and changing their chemical and physical characteristics. Jet fuel and biodiesel fuel require a mixture of molecules with between 10 and 14 carbon atoms, while gasoline requires only eight carbon atoms; this process can be controlled to elicit exactly the type of fuel desired. Finally, in a last step the crude fuel is refined further to obtain the desired properties, even though the basic building blocks of the particular fuel are not changed. NC State received provisional patents to use the process to convert fats into jet fuel or additives for cold-weather biodiesel fuels. The technology has been licensed by Diversified Energy Corp., a privately held Arizona company specializing in the development of advanced alternative and renewable energy technologies and projects. Dr. William Roberts, professor of mechanical and aerospace engineering and director of the Applied Energy Research Laboratory at NC State, developed the biofuels process with NC State’s Dr. Henry Lamb, associate professor of chemical and biomolecular engineering; Dr. Larry Stikeleather, professor of biological and agricultural engineering; and Tim Turner of Turner Engineering in Carrboro, N.C.
Roberts says that besides being “100 percent green,” the new technology has some key advantages over other biofuel projects. The fuel created by the new process also burns cleaner, so it’s better for the environment, Roberts says. There is no soot or particulate matter associated with fuel from fats. Further, Roberts says, the Centia process puts to use what other biodiesel processes throw away. Converting feedstock into fuel produces a low-value commodity – glycerol – as a by-product. Rather than discarding glycerol as waste like most biodiesel plants do, the NC State engineers’ process burns glycerol cleanly and efficiently to provide some of the process’ requisite high temperatures. "Instead of composting the glycerol as waste, we use it as an integral part of the fuel-making process," Roberts said. It really does take a rocket scientist to make jet fuel, especially out of oils or agricultural crops, Roberts says. The physical and chemical properties of traditional biodiesel fuels – their combustion characteristics and viscosity, for example – don’t match the stringent requirements required of jet fuels, making biodiesel unacceptable for the task. "Jet fuel travels at 25,000 to 35,000 feet where temperatures can reach 70 degrees below zero Fahrenheit, so it needs to flow better in cold temperatures," Roberts says.